Lakeview Car Care ensures proper mounting of your new tires by providing our stores with state-of-the-art tire mounting equipment—equipment designed to handle almost all tire and rim combinations. limited warranty*. *See your auto advisor for complete terms and conditions of written, limited warranties. This lifetime warranty only applies to you—the original owner/purchaser—and the original tires identified on the customer invoice for as long as you own your tires. 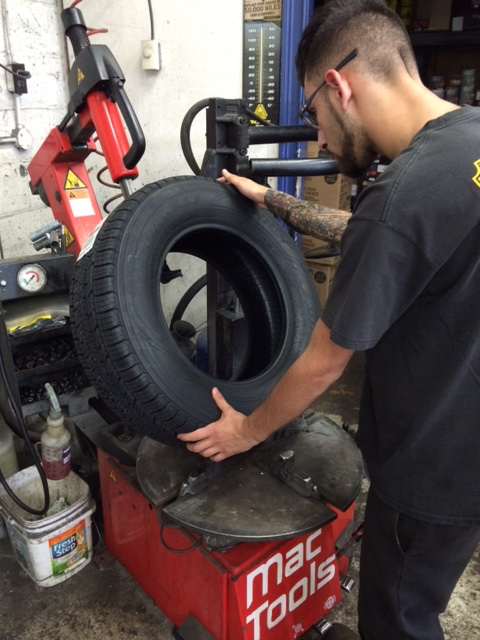 Our technicians are flat tire experts. We’ll examine your flat tire to see if it has a repairable condition. If it can be repaired, we’ll use the proper materials and procedures to fix it right. More extensive damage to your tire may mean replacing the tire completely. Ask an auto advisor for assistance, and we’ll get you back on the road quickly. Having the tires inspected regularly can help you avoid dangerous tire conditions and prolong the life of your tires. We provide a free inspection service and show you what signs of potential tire failure to look for so you can be confident on the road. Remember, proper tire inflation is important. Don’t hesitate to ask for help in knowing how to ensure your tires are inflated properly. Most people forget about their tires until something goes wrong. The truth is, tires lose pressure daily. In cool weather, a tire will typically lose one or two pounds of air per month. In warm weather, tires lose even more air. That’s why it’s recommended that you check air pressure every other time you stop to fill up your gas tank. Keep in mind that many vehicles have different tire pressures on the front and rear axle. And don’t forget to check the pressure in your spare tire. TPMS Dash Icon – This icon means your one or more of your tires is significantly under-inflated!